Silica, which primarily exists in nature as quartz, is a very common mineral found in many materials present on construction sites, including soil, sand, concrete, masonry, rock, granite, and landscaping materials. The dust created by cutting, grinding, drilling or otherwise disturbing these materials can contain crystalline silica particles. In large amounts, you may see clouds of visible dust, but the particles themselves are so tiny that they could be in the air even without that visual evidence. Without protection and a proper cleanup method, workers are likely to be inhaling these carcinogenic particles without even realizing it. How do you clean silica dust? So how can you clean up a site without throwing invisible deadly dust in the air? If you’re using a dry sweeping machine, it’ll need to have a compliant filter, like the MERV 17 HEPA filters on the PowerBoss Armadillo and Atlas sweepers. 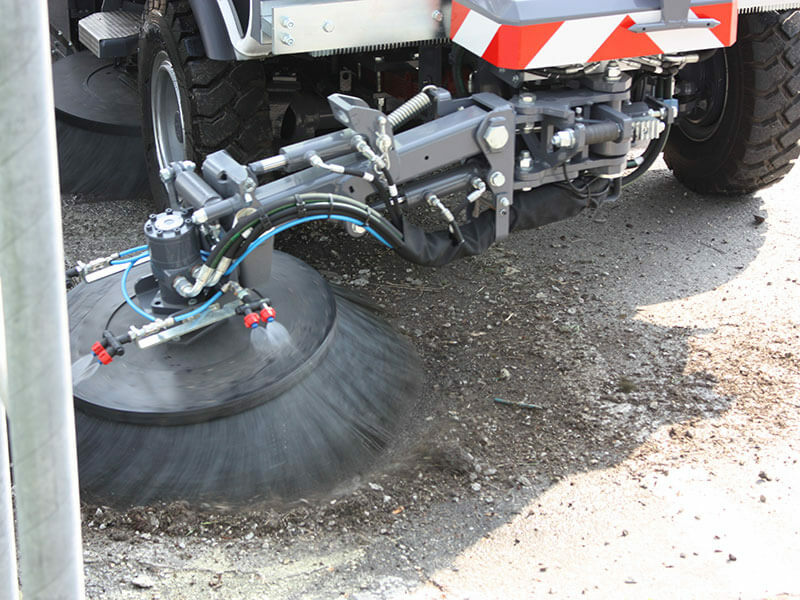 These machines also have the ability to perform wet sweeping to further prevent dust from going airborne. Similarly, on a larger scale, street sweepers need to be able to keep the dust down with a spray of water, or a sufficient dry sweeping method. The Dulevo 850, 3000 Revolution, 5000 Evolution, and 6000 Revolution street sweepers do just that. What are the silica control regulations? a temporary worker removing concrete from the deck of a bridge without being trained on silica hazards. The company is contesting the violations. These new regulations for respirable crystalline silica dust control have now been in effect for the construction industry for over a year. The regulations also apply to maritime and general industry. Clearly, OSHA isn’t messing around with enforcement. Read up on the regulations here and make sure to create a silica dust control plan if you haven’t already.